It’s time! Peace in an Age of Metal and Men has been unleashed upon the world! This has been a long wait, but it’s finally here. 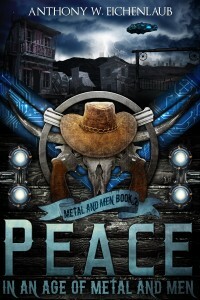 Peace in an Age of Metal and Men is BY FAR my most ambitious writing project to date. I’ve done some things in this book that are significantly harder to pull off. It’s a much longer book and it’s far more complex. Am I happy with how it turned out? These Metal and Men books are so much fun to write. They’re packed with action and emotion and adventure. This book is no different from Justice in an Age of Metal and Men, but it’s significantly MORE. More characters, more action, more plot twists. It’s more of everything that I liked about the first book and it adds to J.D.’s story in significant ways. J.D. has a tough time in this book. He has to make some pretty difficult decisions. Something ain’t right in the town of Swallow Hill. A boy’s cold-blooded murder yanks J.D. from his life of peace. Guilt at past failures drives him, but soon the problem in Swallow Hill proves to be too much to solve alone. Problem is, there’s nobody he can trust: not his old war buddy, not the sheriff, and definitely not the good-looking gentleman from the city. Seems everyone around wants him to shoot someone else. J.D. has to decide: is he going to go in guns blazing, or is there a better way? Can there possibly be Peace in an Age of Metal and Men?